Planning on driving? Most travellers will take the ferry from Nova Scotia to either Port aux Basques or Argentia, and there are ferry routes for travelling between the island and Labrador. You can also drive to Labrador from the mainland of Canada, via Québec. Located at the most easterly edge of North America, Newfoundland and Labrador makes a great road-trip destination. Most auto travellers access the province by Marine Atlantic ferries, which operate between Nova Scotia and the island of Newfoundland. These modern vessels carry thousands of vehicles and passengers to the island every year. There is year-round service between North Sydney, Nova Scotia and Port aux Basques, in southwestern Newfoundland. Most days have two sailings – morning and evening – and the crossing takes six to eight hours, depending on weather. From June to September there is also service between North Sydney, Nova Scotia and Argentia, on the Avalon Peninsula, a 90-minute drive from the capital city of St. John's. This longer trip, about 15 hours, runs three times a week. It’s possible to drive to Labrador from the mainland of Canada, via Québec. You can reach western Labrador via Québec Route 389, a partially paved 570-kilometre highway that runs north from Baie-Comeau. The travel time is about eight hours. Approximately 300 kilometres of the road is paved, in two sections, with the remainder being gravel. Services along the route are very limited, but the terrain is marvellous, rising from the lower reaches of the North Shore to the escarpment that is the Canadian Shield. Crossing from Québec to Labrador moves you from Eastern Time to Atlantic Time (1 hour ahead). From Labrador City and Wabush to L’Anse-au-Clair, the Trans-Labrador Highway crosses The Big Land connecting the west to the south coast, 1,135 kilometres away. The first 533 kilometres on Route 500 between Labrador City and Happy Valley-Goose Bay is paved. Route 510 is partially paved between Happy Valley-Goose Bay and Red Bay, and paved between Red Bay and L’Anse-au-Clair. The road can be a challenging drive, with no cellphone service or gas stations for many kilometres outside towns and communities. Before heading out, travellers are encouraged to borrow a satellite phone to make sure your drive is a safe one. You can find more information on the phones and the drive at Destination Labrador. 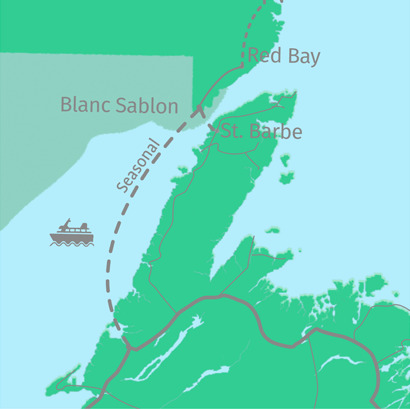 To get to Labrador from the island of Newfoundland, take the ferry that runs from St. Barbe on the island’s Great Northern Peninsula to Blanc Sablon, on Québec’s southernmost coast, right next to the border with Labrador. During peak season, the ferry runs several times each day, and the crossing takes less than two hours. The trip is a great opportunity to spot whales and birds, so keep a lookout while you’re on board. There’s a switch in time zones as you cross between the provinces, be sure to double check crossing times (the schedule on the website uses Newfoundland Time for all departures).